The CleanFinancial.com guide to tight spreads. This is quite simple, investors prefer tight spreads because a tighter spread means that the market being traded does not have to move as far before the position is profitable. With spread betting, you are quoted two prices e.g. the FTSE 100 is currently 6742.5 – 6743.5. The difference between the two prices is known as the ‘spread’. If the difference is 1 point, it’s known as a 1 point spread. A one point, or less than one point, is generally considered to be a ‘tight spread’ and reasonable value. Gold, crude oil, the NASDAQ 100 and the S&P500 tend to have slightly wider spreads of around 3-5 points. So not as tight as the above, but not prohibitive. A number of firms offer 24 hour trading (5 days a week). For 24 hour trading, the forex markets tends to be fairly consistent e.g. Financial Spreads keeps its EUR/USD and USD/JPY spreads at 0.8pts throughout the night. However, the spreads on stock market indices are often wider in out-of-normal-market-hours trading. E.g. it’s common for the FTSE 100 spread to be 4 points from 11pm to 7am (London time). In order to compare the markets, we have a series of spread betting comparison tables on our spread betting companies page. Note that these tables compare companies with fixed spreads and the ‘typical spread’ of the companies with variable spreads. Some companies offer fixed spreads e.g. the spread for a given market is fixed. E.g. 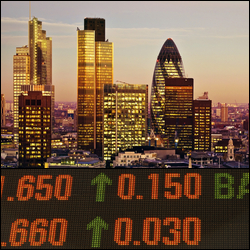 Financial Spreads fix their FTSE 100 market at 1 point during market hours and at 5 points for out-of-hours trading. Some companies prefer to offer variable spreads. Therefore when a market is highly liquid, they can pass on the tighter spreads, that they are get on the exchanges, to their clients. It’s usually better to pay attention to the ‘Typical Spreads’ that these companies quote rather than their tightest (minimum) spread. The Typical Spread is the average spread that clients have actually traded over a set period, e.g. in marketing promotions companies often quote a specific 2 week period of ‘Typical Spreads’. If you are trading highly liquid markets during market hours, then you may be better off with variable spreads. However, this editor prefers the clarity of trading fixed spreads. Also, these days the big firms tend to offer rather similar spreads. Spread betting can offer low cost trading on popular markets, however, but as soon as you start trading the less popular markets, the spreads quickly get wider. With wide spreads, the underlying market has to move a lot further before you can close your trade for a profit. E.g. GFT normally quote the FTSE 100 at 1 point for in-hours trading, but their copper market has a 16 point spread, their Korea 200 index has a 20 point spread and their Mexico 35 Index has a 30+ point spread. It’s a similar story with the other firms. As mentioned above, some firms that offer fixed spreads will have wider fixed spreads at night. Apart from that, they tend not to widen them. There are exceptions though, sometimes a spread betting company may need to be defensive during a Black Swan event, or market crash. E.g. during the Japanese Tsunami of 2011, most firms widened the spread on their Nikkei 225 markets for a couple of days. These events are rare though, companies like Capital Spreads, Financial Spreads and InterTrader did not widen their spreads during 2012 or 2013. If you think of the ‘spread’ as being like the spread betting companies’ commission, then it seems reasonable to pay something. You may see the occasional short-term zero point spread for marketing campaigns, but this editor is not keen on permanent zero point spreads. If the company isn’t making much money then they will find it difficult to invest in better platforms. Also, if they aren’t making much money, how safe is my money? World Spreads used to offer zero point spreads to its big clients for most popular markets. WorldSpreads also ended up in financial difficulties and closed. These events may or may not be related. Either way, I want a tight spread but I still want my brokers to be profitable.